We're treating the ladies this month, in celebration of International Women's Day! 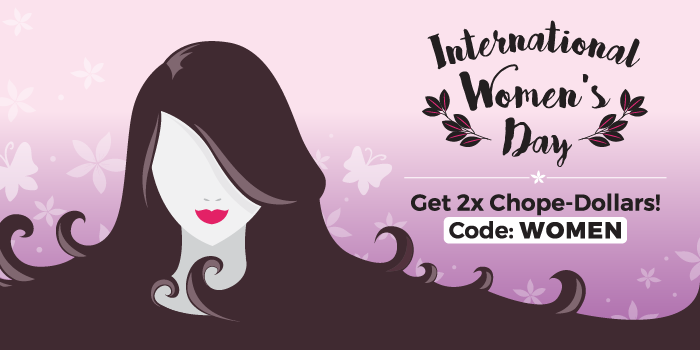 Book now with code WOMEN to enjoy the following exclusive offers for female diners, plus get 2X Chope-Dollars. Bookings must be fulfilled by 8 April 2017. Enjoy 10% off the Savouring Art Menu and receive 200 Chope-Dollars when you book via Chope with promo code WOMEN from 8 March to 8 April. Receive a complimentary Burnt Rice Pudding for every female diner with minimum dinner spend of HK$300 per diner, and receive 200 Chope-Dollars when you book via Chope with promo code WOMEN from 8 March to 8 April. Receive a complimentary Skillet Pancake with Vanilla ice cream and golden syrup for every female diner with minimum dinner spend of HK$250 per diner, and receive 200 Chope-Dollars when you book via Chope with promo code WOMEN from 8 March to 8 April. Receive a complimentary dessert for every female diner with dinner purchase, and receive 200 Chope-Dollars when you book via Chope with promo code WOMEN from 8 March to 8 April. Receive a complimentary 'Scarlett Romance' cocktail for every female diner with meal purchase, and receive 200 Chope-Dollars when you book via Chope with promo code WOMEN from 8 March to 8 April. Receive a complimentary 'Floral Kiss' cocktail for every female diner with meal purchase, and receive 200 Chope-Dollars when you book via Chope with promo code WOMEN from 8 March to 8 April. Receive a complimentary glass of house wine for every female diner with dinner purchase from Sundays to Thursdays, and receive 200 Chope-Dollars when you book via Chope with promo code WOMEN from 8 March to 8 April. In each offer listed, the restaurant reserves the right of final decision. Booking must be made with promo code WOMEN in order to enjoy the offer.